The catastrophic flooding in Thailand is affecting the production of several key end products, electronic parts and subsystems—most notably automobiles, car components, cameras, analog and discrete semiconductors, and hard disk drives. The disruption to the electronics supply chain is having an indirect impact in turn on the production of other devices and systems, including notebook PCs, dynamic random access memory (DRAM), cameras and set-top boxes. Beyond Thailand itself, the worst-impacted country is Japan, which maintains extensive manufacturing operations in areas affected by the disaster. As a result of the flooding, the HDD industry in the fourth quarter will suffer its worst downturn in three years. HDD shipments in the fourth quarter will decline to 125 million units, down 27.7 percent from 173 million in the third quarter. The drop is the largest sequential decrease on a percentage basis since the fourth quarter of 2008 when shipments fell 21.2 percent during the worst point of the last electronics downturn. IHS estimates that 30 percent of HDD production in the fourth quarter this year will be lost because of the disaster. This will result in a significant shortage of HDDs. Because of the shortage, HDD inventories will be depleted and will cause average HDD pricing to rise by 10 percent in the fourth quarter compared to the third. The downturn will be spurred by production disruptions and stoppages at the manufacturing operations of some of the world’s largest HDD makers—namely Western Digital Corp. and Toshiba Corp.—as well at suppliers of key components. Thailand is the world’s second-largest producer of HDDs after China and is a major supplier of hard drive parts. Given the direct impact of the disaster on its operations, Western Digital is likely to lose its status as the world’s largest shipper of HDDs, with its rank expected to fall two positions to third in the fourth quarter, down from first place in the third quarter. Toshiba’s rank could fall to fourth place, down from fifth. In the PC market, the HDD shortage is likely to have the greatest impact on notebook PCs. The specific HDD plants affected by the flooding make devices designed for mobile computers. However, the PC industry appears to have sufficient stockpiles to last through the fourth quarter, so a disruption to notebook shipments in 2011 is not expected. 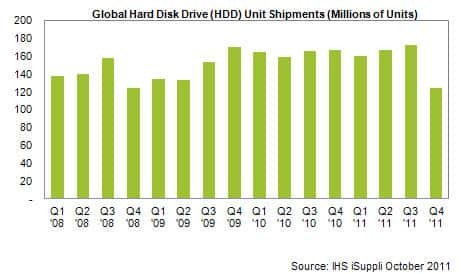 Just the same, with HDD production disruptions expected to last at least six months, the shortage could impact notebook PC production in the first quarter of 2012. Starting in the second quarter next year, IHS expects the notebook supply chain to begin to adjust to the impact of the disaster, obtaining hard drives from alternative sources in different regions and using other types of storage solutions, including solid state drives (SSDs). Such a workaround will allow the notebook supply chain to mitigate the impact of the HDD shortage. In another fallout from the disaster, the DRAM market could be negatively impacted by slowing sales of notebook PCs. Any reduction in PC sales due to supply chain constraints will further depress the already oversupplied DRAM market. In the automotive sector, eight original equipment manufacturers (OEM) that build cars in central Thailand have halted all output. The manufacturers are Ford, Mazda, Hino, Honda, Isuzu, Mitsubishi, Nissan and Toyota. These OEMs announced that they have suspended production until the end of October, although IHS expects the action to extend into mid-November. IHS Automotive downgraded Thailand’s light-vehicle forecast to 1.64 million units in the fourth quarter, down from 1.77 million units. A further reduction of 50,000 to 75,000 units is possible. Already, floods have affected vehicles to be exported to core markets in the ASEAN region, Australia, Japan and the Middle East. Thailand’s exports account for 56 percent of total production. The loss of critical automotive electronic component and parts supply from Thailand also has impacted Japan’s car output. In particular, prolonged part-inventory issues from Thailand may cause Japanese suppliers and OEMs to force further production adjustments. A key challenge could come sometime in the fourth quarter and the first quarter of 2012, as the Japanese continue trying to compensate for lost output from the country’s earthquake disaster earlier in March. The component shortages out of Thailand also are expected to impact car manufacturing facilities in North America, Europe and China. In the camera sector, the Thailand camera manufacturing operations of Sony, Nikon and Canon all have been disrupted or suspended by the flooding. As a result, IHS iSuppli anticipates that overall camera shipments will drop in the fourth quarter and possibly in the first quarter of 2012. Lastly, the manufacturing operations of two major analog and discrete semiconductor suppliers—On Semiconductor and Microsemi—have faced a significant impact from the disaster in Thailand. Fellow suppliers Rohm and Toshiba also have been affected, but to a lesser degree. For now, IHS believes the manufacturing disruptions at On Semiconductor and Microsemi will have minimal impact on the entire semiconductor industry. However, whatever direct impact there may be will be felt mostly in the Japanese market. This is because On Semiconductor has limited alternative sites in which to move the test and assembly of customized packages for customers in Japan. Overall, the Thailand flooding represents the second major natural disaster to affect Japan this year, after the March earthquake. Thailand plays a key role in the manufacturing operations of Japanese companies, with an estimated 1,800 Japanese manufacturers operating in that country and 450 Japanese businesses located in seven flood-hit industrial parks.